We were in love with the Lodge from the moment we arrived. The architecture, the patina of the materials and the thoughtful design were not lost on us. It really is a home and not simply a vacation rental – made so by the love Annette and Mickey put into every detail Thank you for giving us everything we needed to prepare meals, build a big fire, spend days in the river and then sleep like a rock! We took long walks with the dogs to sniff every leaf and collect kindling. We would love to stay again and appreciate the generosity you’ve extended to us. The cabin exceeded our expectations for a rental property. The owners, Annette and Mickey, left no stone untouched in creating a warm and loving environment filled with family history, handmade furniture, and re-purposed wood from their grandfather’s cabin. If you’re looking for a place to feel close to nature, to feel welcomed, and to feel the love that went into creating a warm and inviting home away from home, this is the place. I can’t begin to explain what an incredible experience we had at your wonderful lodge. Our group has been fishing together for many years, but we all agreed that this trip was our best ever. The fishing was really good, the weather spectacular, and your lodge way better than we expected. We all noticed and appreciated the attention to detail and your sense of great design and craftsmanship. We tried to honor your beautiful home by caring for it as if our own. Thank you for letting us experience your little corner of paradise. What a beautiful place, your love of this cabin really shows. The incorporation of all the reclaimed wood was so cool. Your attention to detail was exceptional, from the teas and coffees to the books and beanie babies, we could have packed so much less. I’ve stayed in a few rentals, but yours epitomized what I would want in a cabin. We had one of our best vacations, so many memories were made, and we had snow! My daughter had never been to the mountains, and to get snow made our trip all the more special. Your suggestions were so helpful. We hiked to Rufus Morgan Falls, another first for my daughter. Dakota was an excellent guide. I caught the big trout much to the dismay of my stepfather on my 4th or 5th fly cast ever. I think Dakota was as excited as I was. We really enjoyed the fishing. Dakota was so patient and helpful. Thanks again! We can’t wait to come back!! I’m still not sure I know how to put into words how truly awesome the Lodge is. We were in awe from the time we walked in until we had to leave. We both talked about how sad we were to leave and how someday we too would love to have such a place of our own. We were there to celebrate our honeymoon and as I read that too is what originally took Mickey’s grandparents to that area, it made the entire experience even that much more meaningful. We can’t wait to come back. Thank you again for everything! It was everything we expected and so much more and I kid you not when I say I must have looked at 1,000 cabins before I finally found yours. We appreciate you guys and your willingness to open the Lodge up to visitors such as ourselves. We wouldn’t have near the great memories that we do had we been anywhere else but the Nantahala River Lodge. We cannot express how much we loved your Lodge…!!! We were blown away with everything about the land, architecture, the lodge and amenities… We travel a lot and have stayed in many places, but my wife could not stop talking about how well your kitchen was supplied… she loved it! And the beds were so comfortable!! Thank you again for allowing our dog to stay. She loved the river and the Lodge. We have already talked about when we can come back and stay again. I had the privilege of staying at your lodge and would like to take this opportunity to thank you for making such a beautiful place available for us to enjoy. My only problem was that the stay was nowhere near long enough. Hopefully we will get with you in the future and try to stay longer. Once again, your place is wonderful and thank you. The Nantahala River Lodge was spectacular. We had a great time at the Lodge and enjoyed many activities. I marveled how well explained and labeled every appliance, light switch, and procedure for the home was. You have thought of every possible question that a renter may experience and on top of that explained in detail and without making us feel as if we could not use things. It made using things easier! The grounds, the area, the grandeur are a playground for outdoor people. This is a definite must return again place. Thank you for a wonderful experience. I just wanted to thank you for letting us share your wonderful home! We had such a great time! I was impresed the lodge was so well stocked. You guys thought of EVERYTHING! The decor was wonderful! Every day I saw something new that I had not seen before. The guys wade fished and caught a lot of trout. I fished from the bank and even caught trout I waded in the cool water. We spent hours sitting on the balcony and in the chairs by the water. We slept with the windows open to hear the rushing water at night and it was just great. Every day we took scenic dirves, Cherokee, Clingman’s Dome, Fontana Dam, Great Smoky Mountain train ride, waterfalls, etc. We tried several of the local restaurants and the Potter’s House was definitely a favorite!. I believe we did almost everything we could do in a week – including seeing a bear in the GSM National Park!!! We had a grand time in your house. We were so happy to find it as described, “right on the river”. The men had a wonderful time with the catch and release. I’m sure they will underestimate how many fish they actually caught and released while we were there. 30 or more almost every day – and they did take time for road trips! They were so happy with the fishing within walking distance; they never drove to another location. We toured Biltmore on our way in, and took many scenic drives including some of the waterfalls (we loved the dry falls), Cherokee museum and casino, Clingman’s Dome and Fontana Dam. We enjoyed our evenings outside by the river. The dining table was a perfect place for games to end the evenings. We have stayed in a lot of rental homes, but this is by far the best-provisioned house. Everything was perfect, we are too spoiled now, so once we win the lottery we will offer to rent all summer! Our dog loved exploring outside. The kids took her to the river and on lots of walks and she loved lounging on the deck! Everything was so detailed (thank goodness for the lighting labels) it made it easy for inexperienced renters like us. I designed “spec” houses for builders for many years, so it was hard to get me out of the cabin, so many wonderful details to enjoy! I have not ever see such a well built and coordinated home. Every finish was perfect! We can’t wait to come back for a week! Thanks so much for a wonderful stay. The Lodge was lovely, we really enjoyed our time there. The river is beautiful and the Lodge makes it so easy to relax and take in the beautiful surroundings. We cannot thank you enough for our wonderful, wonderful stay at the River Lodge. It was truly amazing. We have traveled and stayed in many cabins, many locations, but this by far was the most enjoyable. You guys did not miss a thing! That cabin and property clearly show that this is a place that means a lot to you. The character the Lodge has is just outstanding. The architecture is just amazing – from the wood from the old cabin and how it is used, to the furniture, to the decor, colors, placement of everything! We were already excited, but the moment we walked in – it just felt so good. We jut appreciated every single the Lodge had to offer. On top of being so amazing, after getting unloaded and familiar with the cabin, looking around at all the pictures and wall decor, we cam across the passage from the book Troug Magic written by Robert Traver (John D Voelker). That is one of our favorite books and favorite authors. We were actually reading that book outloud to each other years ago and got to that passage and it just moved us. We copied it and set it aside to do something with one day. So the fact that you guys framed it and had it up, was just another point as to how right everything feels for us right now in our lives. Our week at the Nantahala River Lodge was certainly an amazing one – one that we will remember forever and definitely a place that we will visit again! We are already trying to plan our next trip there. Like I mentioned before, we have traveled around quite a bit, and have decided that this is the place we want to start a tradition. We literally could not find a single that that we would have done differently. Everything was so well communicated and spelled out and so nice. It made everything so easy, and allowed us to enjoy everything else. It was so nice being able to step out into the river and fish – and believe me, did we fish! We caught the river slam over and over! Brook, Rainbow, Brown – all sizes, all beautiful! Again thank you so much. You guys are so nice to deal with and communication was amazing. Everything was AMAZING. My friends and I had a wonderful time in your Lodge. It is not often that an experience is better than one expected, but this was one of those rare times. Your property is a treasure, and the care you have put into it shows. As I examine the grounds, I am struck by the sheer volume of work and vision that it has taken to make this place what it is. As I looked at the Lodge, more than anything, I wanted to meet the architect. The structure is a master stroke of design and relationship between the land, the river, and the people lucky enough to be staying there. I am totally impressed and feel that we will return there often. Our family’s stay at the River Lodge was a real joy for us all. There were 5 of us; we had plenty of space and had some real quality time with each other. The fishing was excellent at the Lodge and up river. We caught several trout in the 16 to 18 inch category. Two rainy days tended to dampen our spirits a litle, but we found other things to do to hold our interest. Thanks for taking such fine care of your wild flowers. I found 3 (maybe 4) varieties of Goldenrod on the property; maybe 5 types of asters; Lobelia; Sharp-Lobed Hepatica (without flowers of course); White Snakeroot; Yellow Cone Flowers, several ferns and other attractive plants not on my recognizable list. The scenery was just splended with lots of various hues and colors. We also took a ride around Nantahala Lake, enjoying the scenery in that particular area and its small waterfalls. We cooked at the cabin every evening using the charcoal stove and the barbecue; we never went out into the community to have dinner tho we had planned to do so before our arrival. The kids had so many dishes and types of foods they wanted to share with us we never had any need to venture forth to find a restaurant. We never really got to know the area all that well because we just enjoyed hanging out at the Lodge. We trust we will find the opportunity to return for another exciting yet relaxing stay at your Lodge. Thank you also for the oversight you provided and the friendly manner of conducting our business together. We all want to tell you how much we enjoyed your cabin. There was not one detail overlooked and the house was exquisite in every way. The view was great and the sound of the river was amazing. Our trip was pretty low key since I am expecting our first child. We are looking forward to coming back next summer with our new baby! Thank you for sharing your piece of heaven with us. Thanks again for a memorable vacation. Thank you so much for renting your beautiful cabin to us. I am in awe of the attention to detail you put into everything. I have never seen a rental property of any kind like yours. It was the perfect place to have our 35th anniversary. We took advantage of your generous offer for early check-in. Once there, we didn’t want to leave. Again, thank you for your hospitality. We could not have asked for a better place. We both really hated to leave it, but had to get back to work and the real world. About our stay: it was absolutely wonderful. You are correct in thinking that my Daisy and Lucie were perfect ladies! Like their grandmother, they were mostly content to sit out on the porch. I have driven by the River Lodge so very many times and wondered what it might be like inside. I expected the scenery to be beautiful, and it was. I did not anticipate that the Lodge itself would be so very beautiful. Honestly, when I saw the obvious care and attention to detail you have lavished on the house, I could not believe that you would share it with others. I am so grateful that you were willing to share it with me. As a historian, I was fascinated by the wonderful antique wood and stone details, even though I completely enjoyed the thoroughly modern kitchen and bathrooms! You obviously have great love for the house, and we treated it with love, as well. I hope that you will allow us to enjoy the River Lodge again and again. Thank you for everything. Your place is absolutely gorgeous!!!!! Every detail throughout the cabin is tremendous!!!! Views, comfy beds, awesome showers, chef quality kitchen…seriously, we had a great relaxing time!!! Thank you for everything. All of your instructions were great and so appreciated. I know we and our friends will definitely come to your cabin again. Thank you again for such a great place to stay and enjoy! My husband and I, along with our son and grandchildren, thoroughly enjoyed our stay in your amazing mountain house. The attention to detail, and the use of material from the old barn and houses, makes it a very unique retreat. It is the most well-equipped rental property we’ve ever occupied. My husband caught an 18-inch native brown trout right in front of the house! My grandson, and I caught our first rainbows. Even though we had to deal with a calamity te first evening (fish hook in son’s finger), it didn’t spoil our trip. I took him to the Swain County Hospital, where everyone was extremely friendly, attentive, and professional. We kept telling them how impressed we were. My son kept fishing and said it was a fantastic trip. Thank you for being so efficient and helpful. Through the years I have stayed in quite a few rental homes on different vacations. The worst was in Homer Alaska when we discovered our rental had the owner living in the basement! The best experience I have ever had was at your property last week. I can’t tell you how impressed I was with how well thought out everything was. I especially liked the custom made charcoal grill/smoker by the river and the generator came in very handy during a night of power outages as storms swept through the area. 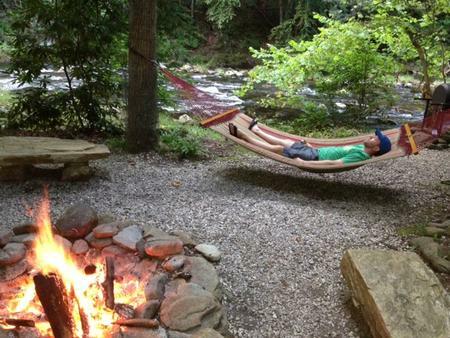 You have a little slice of heaven there on the Nantahala and I plan on renting the Lodge again someday in the future. I would recommend the Lodge to anyone, but I am reluctant to do so as some things arae better kept a secret and it might be booked next time I look for open dates! We had a wonderful trip and really enjoyed our return stay at the Lodge. The snow really made the place even more beautiful and we were glad to have such extraordinary accommodations to stay indoors and enjoy. Our dogs both absolutely loved the snow. Quinna surprised us a couple of times by wading out into the water while we were fishing to see if we needed any help. She had some icicles forming on her fur! Unbelievable for a Florida dog! She also certainly enjoyed the fireplace. Thanks again for making us feel right at home. We look forward to our next stay at the Lodge. It really is a special place and we feel like it has become a family tradition for us to visit when we can. Happy New Year! We didn’t want to leave. My wife wants to not only move to the area, she wants to live in your home specifically. She loved it! We all loved it! The openness of downstairs with the deck, the sound of the river at night while we slept, and just relaxing outside in cool temps that we don’t have in Florida right now. The dogs loved it too. They are so depressed without haviing their own river and woods to explore. We hope we can stay there again in the future. It was one of the most enjoyable and rejuvenating getaways I can remember. Well, here we are back in hot, humid Gainesville longing so for the wonderful, cool river breeze from the Nantahala, rocking peacefully on the deck enjoying every wonder, small and large, that your River Lodge has to offer. Needless to say, we all had the time of our lives!!! I honestly could go on and on about your Lodge – words though simply cannot express what the Lodge has to offer. It is comfort with class and class with comfort! I just hate that we did not have more time. Without a doubt, one day, and I hope soon, we will be back! Just one last thing about the “awesomeness” of your Lodge. As we were opening the windows in the master bedroom my husband said “five hundred” and I replied what do you mean by 500? “This is number 500 of the cool things that I have seen in this cabin”. Need I say more. Our 16 year old had the “best vacation ever”. Your hospitality is immeasurable! P.S. Your dreams have been met – what you have is a place where nature, peace, beauty, comfort and family have all come together and we were so fortunate to be a part of it. I had the most fun in North Carolina that I have ever had. The house is so beautiful and so close to beautiful nature. I caught the fish of a lifetime and the other 40 or so others didn’t hurt to catch. I would do anything to return here. Thanks a bunch for your hospitality. The time you have here to clear your head equals a thousand years of meditation. If anything troubles you, find a rock in the river to sit on. In seconds, nothing matters. The Lodge has allowed me to find my place in the world; fishing and manual labor. So pick up a fly rod, dry fly, nymph or streamer. It does not matter. Forget the troubles of the world as you are lifted to heaven. Just a note to tell you how much we enjoyed our stay at your Lodge. My family wants to book Thanksgiving if it’s available! We felt like treasured guests rather than renters, with every need anticipated. Where in the world did you have the labels fabricated? You answered every question before we asked – and if I were to design my perfect vision of a river house – this would be it! I’ll be sending pictures as soon as I get home, but couldn’t wait to tell you how much we enjoyed ourselves. We had a fantastic time at the Lodge, and we once again thank you for sharing this amazing place! As predicted, my father-in-law fell in love with the Lodge, and marveled over the craftsmanship and attention to detail. We had 3 great days of mountain biking at Tsali, a hike through Joyce Kilmer, a quick trip up to Tellico Gap and then Bateman’s store, and really just enjoyed relaxing at the Lodge. My boys would like to especially thank you for recommending Soda Pops! Once was not enough for my oldest son and his friend…they finished their bike ride ahead of the rest of us on Thursday and snuck off to Bryson City without us for round two. The previous day, I told the owner that we found him because of your book of favorite places, and he was all smiles! Said he knew you, and was most appreciative. I like to support local business owners who work hard to provide something special. Soda Pops was special! Thanks again for a memorable Spring Break! OUr 17 year old said it best…”it just wouldn’t be the same to come to Nantahala and stay anywhere else.” Thanks again for helping to create a Spring Break family tradition that we will all long remember. We absolutely loved it! Ya’ll have done such a great job with the decorating and stocking of appliances, etc. We will definitely stay here again. The boys loved it and didn’t want to come home. We loved everything about it and had no complaints about anything. We will be back in touch as soon as we can plan a longer stay. Thanks for allowing us to share in your little bit of heaven. We had a great time. Your place was nothing but fantastic! Your attention to details was so appreciated by our group. We couldn’t have found a better place to stay. Even the fishing was great. Thanks again, we will definitely go back and the entire group will definitely refer your place. We loved it! The best fishing was right in front of the house. Put us down same time next year! We just had a terrific time at the Lodge – everything was better than we expected. My husband might be the only one who was disappointed – the big fish got away! Thanks for letting us use your beautiful home. We will definitely be back, maybe in the summer, to take advantage of the water activities. We had a great time at your River Lodge. My parents were so impressed by how beautiful your home is and enjoyed reading the history of how you built it. We had so much fun! We canoed Nantahala lake, hiked the Appalachian Trail to the fire tower and hiked Joyce Kilmer forest, tubed at Deep Creek and just enjoyed being by the river and staying at your Lodge. Even when it rained we had a great time playing games inside the Lodge. Our kids loved the campfires and catching fireflies at night. We all have special memories of our time at your River Lodge. When we walked into the River Lodge we felt at home. We could feel and see the love and care that went into the building of the Lodge. Even the smell of the wood made us think of a home far away. Everything we needed was there. Everything had been made ready. We did not want to come home. The weather was great 60 degrees in the morning and 80 degrees in the afternoon. Fall will see us back at the Lodge for sure. Thank you for all you have done. I wish you could have heard when I told my children that we were returning to your home – they all cheered! It was great. We are all very excited. We thoroughly enjoyed your beautiful home in the mountains. The interior decorating is exceptional. I cannot stop talking about the house, the organization and the decor. I love it !!!! We all had a fantastic time and we look forward to visiting there again. Our travel today went like clockwork. I am back home and the humidity is killing me. Again thank you for making our vacation super special. We had the most fabulous time! I can’t even put into words how much we enjoyed the Lodge. Everything about the Lodge was beautiful, top quality and restful. Even though it was cold, we slept with the window open every night to hear the river and the most remarkable thing happened – for the first time in over 10 years I slept through the entire night without waking up once. The combination of the bed, the linens and the sound of the river was just what I needed. And cooking in the kitchen was a complete pleasure. We had a hot breakfast every morning and we grilled every evening (except for the last night when we went to Thirteen Moons). And, of course, the fishing was outstanding! My husband fished in the Smoky Mountain National Park every day, but he had the most fun fishing right outside on our part of the Nantahala (we became very territorial and called the stretch of river along your property “our section”). He fished it every day after we got back from the Park and we decided on the last day not to go to the Park – he fished the Nantahala all day and caught so many fish that he lost count! All in all, we had the best vacation of our lives! We will be back! Meanwhile we are recommending you to everyone we know. If you ever need “babysitters” for the Lodge call us and we’ll be there! I could never have imagined just how wonderful your lodge and river location could be. We are so envious and would love to have a place just like this. We really enjoyed ourselves. My husband caught lots of fish, 25-30 one day up and down the river and I really enjoyed the trails and waterfalls. Can’t wait to visit again! Thanks again for sharing. OMG..did we love your home!!! Your home is truly a work of art. Every detail is artistic and functional. We adored staying there. We mountain biked just about every day at Tsali and went to the Biltmore twice. One time we just took our bikes and rode the trails on the grounds. We loved that Blue Smoke Coffee and every morning we sat on the deck and spent a good hour out there rocking with the dog in our lap. Your kitchen is out of this world. I want to redecorate everything now at my home in NJ! I loved cooking in there and always was amazed by all the subtle surprises of artistic designs. I loved the coke bottle opener! We really had the best time and a well needed get away to get healthy with exercise and nature again. It worked and we thank you so much for the Lodge being MORE that you ever advertised. Mountained biked the Tsali Trails on Sunday with 75 degree weather and then enjoyed the deck and river. Hiked 8 miles of the Bartram Trail on Monday morning in snow and 40 degrees…the creek and river crossings created some real memories! Fished in the snow Monday evening and much of Tuesday…all the boys caught trout and became addicted to fishing the river! Enjoyed inside fireplace and outdoor fire pit each night. Biked and hiked Flint Ridge Trail @ NOC on Wednesday morning, came back and went to The Daily Grind and Wine in Andrews, then went to the trout farm a few miles from the cabin and bought fresh trout for the grill. A fantastic day with high around 60 degrees. Today, we packed up and went back to Tsali for one more ride! As you can see, we packed a lot in, had a real variety of weather, and it just couldn’t have been any better. Our family and the family we shared the cabin with, will be talking about this Spring Break for years to come. Actually, we’re already talking about 2010 and I will likely be back in touch with you to see if the cabin is available once we confirm the school calendar. Thank you again for sharing your home! Thank you so very much! We had a relaxing stay at the Lodge. To say it met all of our expectations is indeed an understatement. You and your husband have done a masterful job with the design and construction of this place. Your craftsmen are to be commended. As stated in past conversations, my husband and both of my sons each own a homebuilding company in Atlanta. My husband has been in the business of construction and design for over 20 years. They both examined the Lodge inch by inch and were amazed at the quality of construction – the attention to detail and the quality of materials speaks volumes of everyone involved. We are a rather spoiled family when it comes to our living spaces – and we are usually disappointed when we venture beyond major hotels for vacation stays. However, this time was certainly not the case – the Lodge felt like “home” right down to the comfy sheets/blankets/towels and mattresses. The grounds are so private and I so enjoyed just wandering outside. We had major snow on our arrival and the snow remained during our stay so the kids were in heaven. We shall definitely plan another getaway to the Lodge. We can’t thank you enough! Everything worked out great and we were absolutely amazed at the beautiful property and home you have. The home was beyond our expectations with everything we needed and more! We loved to look at all the workmanship that went into the home. I didn’t even mind cooking in the kitchen with all the amenities. The boys had a fantastic time in the river and didn’t want to leave. We caught and released 8 trout. We can’t wait to return next year! I have already sent your link to two family friends for their vacation. Thank you again! We had a wonderful time. Everyone relaxed and slept in much later than anyone could remember. The guys had a wonderful time fishing. Our annual rafting trip was also a great success. A great deal of success is owed to you for creating the atmosphere. When my daughter was impressed as a supervisor, she would always say “you knocked my socks off”. Well, Annette, YOU KNOCKED OUR SOCKS OFF! We had such a wonderful time at your Lodge. Everything was perfect at the Lodge…I cannot think of anything that needed attention. We really enjoyed our stay and I will send you some of our favorite photos. Annette, everything was great. What a great place you have. We loved the use of all of the salvaged wood. The ceilings were amazing. It did snow a little on Saturday! We had a great time and caught trout (all released). Your cabin has spoiled us from staying in some cabins we get in West Virginia. Everyone wants to go back next year. You have done a great job putting together the cabin and the property. We loved your mountain home and had a great time on our trip. Your place is wonderful. It felt like home away from home. Our stay was too short. Everyone enjoyed the rafting portion of the trip. I think we will try to do more of that in the future. Thanks again for making your home available for others to enjoy too. We had a wonderful time relaxing in your beautiful lodge. Coffee on the porch overlooking the river on those chilly mornings was refreshing. We did catch trout and put them all back. Good to know I still have the knack. Thanks for everything. Our entire family had a blast! We hope to come back again next year.